I was offered a 7yo Qh mare for a low price because every time the owner gets on her she crow hops and rears. I've noticed that she drags both hind toes, clicks in the hind end and won't pick up the left canter lead. There's obviously something seriously wrong here, but I feel so bad for her. Should I go ahead, chance it and get her to a vet or just let the owners know and pass her up. She would be amazing if she wasn't in pain, she's so kind on the ground. What could be causing this? There's a very good chance what ever is wrong will end up being chronic. Hock or stifle arthritis, compensatory issues, ect. I wouldn't risk it. Know that if you tell the owner why you are, they are liable to put their head in the sand ("horse is just being stubborn, what do you know..."). If you can't tell what is going on, I'd pass. Could be so many things. Some simple. Most chronic like @ApuetsoT said. Yeah, that's what I was worried about. I feel bad for her though. If I had enough money to keep her as a pasture potato I would. If you really like the horse...get a vet in for a look-see and tell only you the results of that exam. You need to be smart, be savvy, be informed and use your brain not your heart. But go with a limit to what you will spend or do or you will sell her and send her down the road....as is. You won't know unless you truly look hard, deep and with some professional eyes watching, the vet. If you really think the horse is sweet, has good training on her and you can enjoy her with minimal work and $ put into her upkeep...buy her. But knowing she has a problem...negotiate that price. Anything you find out about her issues beforehand...mum is the word or you could ruin a nice deal in your favor for negotiating..
loosie, boots and Knave like this. Agree with HLG. Who knows what's going on without thorough check. Or how long/how chronic it may be. May be that a few chiro visits will have her right. I'd ask the owner more about it & say that since the horse is in obvious pain you require checkups before considering. I agree with HLG, have a vet do a PPE and try to see what it is. If you really like her and it's issues that can be corrected then good deal. I wouldn't say too much, Just that you see some possible issues and would like to do a PPE. Consult with the vet on what they think and go from there. If you really like the horse, take her to the vet for pre-purchase examination and go from there. It could possibly be just behavioral, or she may have stifle/hock/SI issues. If you aren't "sold" on her, then stay far away. It's hard not to feel sorry for animals with they have dumb owners, but you can't save them all....... Also remember that REARING is very, very dangerous and often difficult to eliminate completely. I was offered a 7yo Qh mare for a low price because every time the owner gets on her she crow hops and rears. When does she crow hop and rear??? I'm wondering if she could be cold-backed which although needs dealing with, to me is not a deal breaker but is something once known is very easily dealt with and you have a good riding partner. 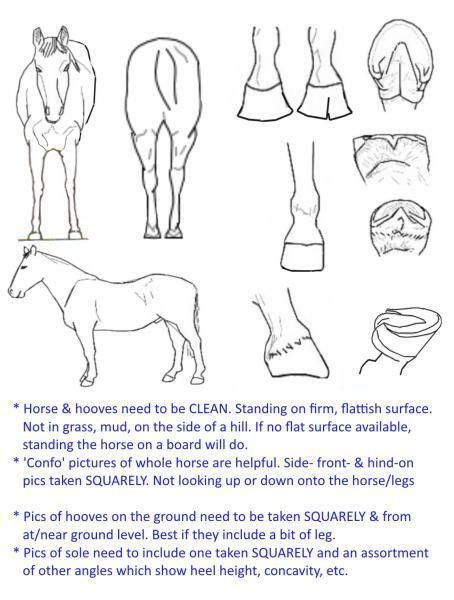 Someone who has confidence to work, ride and acquire the horses respect and working demeanor returned may have a incredible mount hidden in bad behaviors..
That vet check is a must for several areas of the body needing examined.